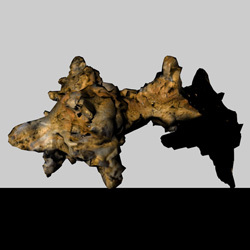 Entropic Growth 220 is a series of scanned growth models created from different organic tree parts. These parts have been connected into an amalgamated freestanding structure. The structure is able to be walked under and also offers hollow areas that allow the viewer to see thorough the surface. These hollow areas are meant to confuse and leave the viewer questioning what it is they are actually seeing. Christopher Manzione earned a BFA in sculpture from William Paterson University, a Post-Baccalaureate degree From Maryland Institute College of Arts and his MFA from Mason Gross School of Art. For the past three years his body of work explored the spaces where the distinction between natural and industrial blurs, while investigating our understanding of time through these points of interaction. In 2010 his work expanded into the field of new media art founding and curating, The Virtual Public Art Project, a platform for the public display of digital works of art. Maximizing public reception of augmented reality art through smartphones. Within the past year Christopher has taken part in Vermont Studio Center Artist Residency, Anderson Ranch Artist Residency, and Socrates Sculpture Park’s Emerging Artist Fellowship.